KUALA LUMPUR - The political rivalry between Tun Dr Mahathir Mohamad and Prime Minister Najib Razak is about to reach new heights. When Dr Mahathir was premier, he built two 88-storey towers, making them the world's tallest buildings when they were ready in 1998. Now Datuk Seri Najib is raising the ante with an 118-storey giant just some 4km away, which is set to be South-east Asia's tallest tower when completed in 2020. 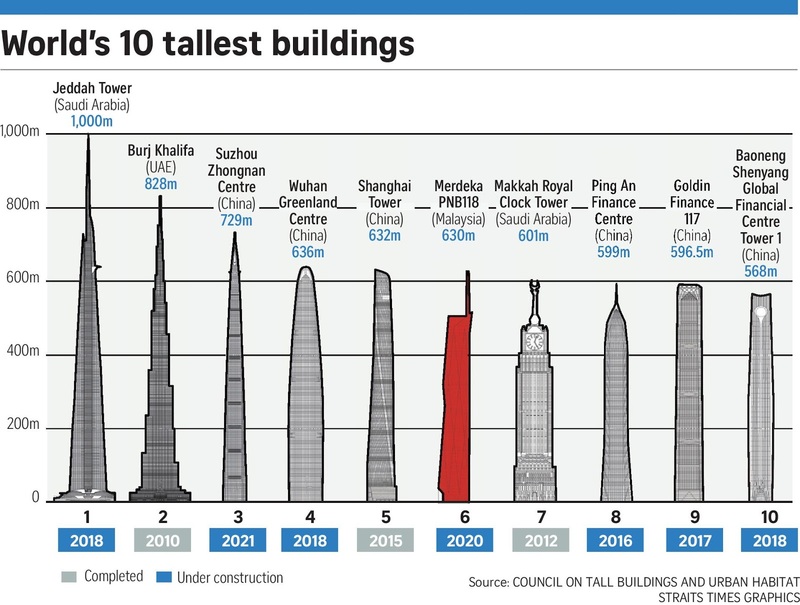 The RM5 billion (S$1.7 billion) project is being built by state equity fund Permodalan Nasional Berhad (PNB) with a height of 630m, compared to Dr Mahathir's 452m-tall Petronas Twin Towers. The new project is located beside the historic Merdeka Stadium, where Malaysia's independence from Britain was announced on Aug 31, 1957, hence the tower will have "merdeka" (independence) as part of its name. The Merdeka PNB118 tower was launched last month by Mr Najib, who had denied he was in a one-upmanship with his mentor turned nemesis. The project's launching comes at a time when Dr Mahathir is making a strong push to topple Mr Najib by blaming the prime minister for the financial scandal tied to state fund 1Malaysia Development Berhad (1MDB). Dr Mahathir had said earlier that his brainchild Twin Towers would be eclipsed by the new tower. "I would like to retain the Twin Towers as the highest buildings in Malaysia. At the moment we don't need any tower higher than that. 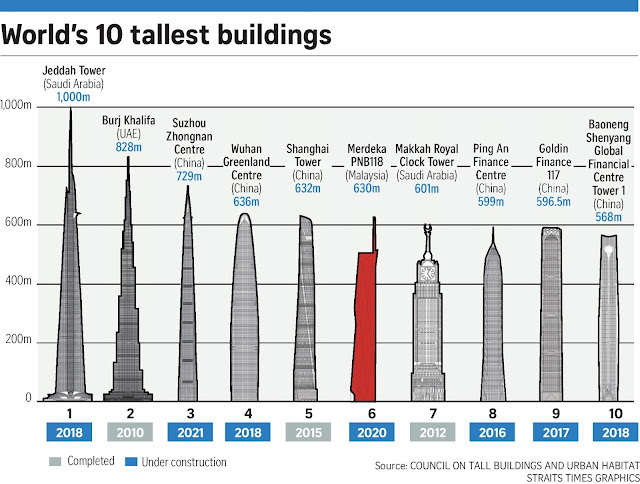 We should build the 100-storey tower, but maybe a little bit later when I am not around," Dr Mahathir, who retired in October 2003 after 22 years in power, said in 2010. Mr Najib's response then was: "No, no, it's not a question of dismantling his (legacy). That's a totally frivolous statement." He added: "What Tun Mahathir has done is admirable, what we need to do is to build on his success and move on." Like the Petronas Twin Towers when it was announced, the new tower has been panned by critics. Some are worried about a glut in office and commercial space in coming years, while others questioned its location in a historic and congested part of Kuala Lumpur. The Petronas Twin Towers were built on former race course land surrounded by narrow traffic-clogged roads. The new tower is being built just beside Chinatown or Petaling Street, where three old stadiums are located - Stadium Merdeka, Stadium Negara and Chin Woo Stadium. Stadium Negara was Malaysia's first indoor stadium. There are also several schools around the upcoming tower. The complex will add about 1.7 million sq ft of office space when completed, in addition to 4.8 million sq ft that will be on offer in 2019 from several other projects. Property expert Y. Y. Lau told reporters that Malaysia had faced an oversupply situation in 2012 which is expected to resolve by 2018 when occupancy rates should rise faster than new completions. But with major property projects coming up from 2019, she said there will be an oversupply situation. "Whether the situation will pick up will depend on the demand," said Ms Lau, country head of JLL Property Services Malaysia. Malaysia's central bank echoed similar worries recently, saying significant incoming supply of office space could worsen the oversupply situation. The report noted that in the next three years, an average of 4.9 million sq feet of office space will be added to the market each year, far more compared with the historical annual average of 2.8 million sq feet. "In other countries, this (an oversupply situation) actually precipitated an economic downturn," deputy governor Dr Sukhdave Singh said at a conference organised by the Malaysian Economic Association. Still, economist Jalilah Baba was more optimistic, saying that the global economic situation could improve and demand may revive when Merdeka PNB118 is finished. "This tower is being built for the future, to attract investors. There is nothing wrong with having more than one tower, as other cities like Chicago are full of high-rise buildings," Datuk Jalilah told The Straits Times. 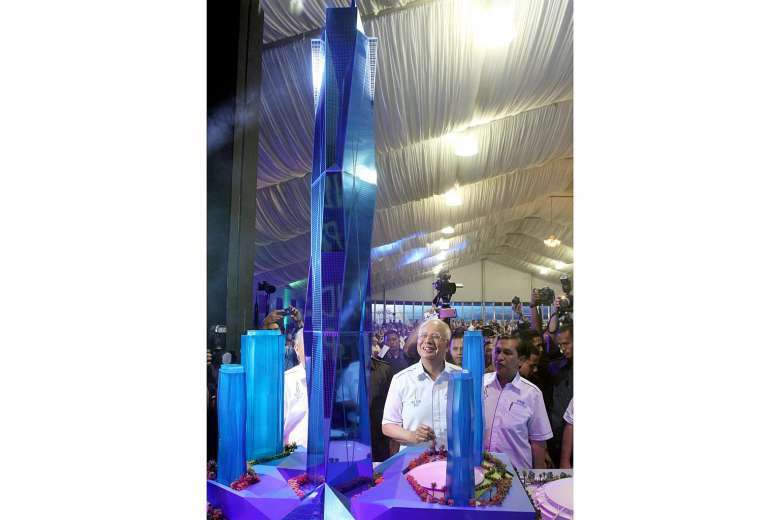 At the project's launching, Mr Najib said the tower will be an iconic landmark that defines Kuala Lumpur as a capital city, attracting both tourists and investors. Instead of being in competition with each other, Ms Jalilah said both the Twin Towers and Merdeka PNB118 should be complementary in promoting Malaysia. "We must have a few buildings that we are proud of instead of just promoting the same building all the time," she said. The tower has faced protests from activists since being mooted, as some had insisted that the project land be turned into a national park. Defend Our Heritage Association coalition president Ishak Surin believed that the futuristic tower would erode history and should be built in more suitable location. "This area has rich history, with this new building, the history of the place will be lost," he said.